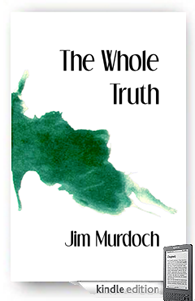 Jim Murdoch is a Scottish writer living just outside Glasgow. His poetry appeared regularly in small press magazines during the seventies and eighties. 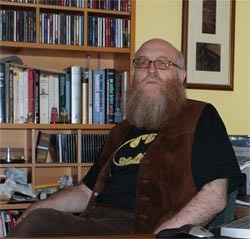 In the nineties he turned to prose-writing and has completed five novels and a collection of short stories. His first novel, Living with the Truth, came out in 2008; the sequel, Stranger than Fiction, followed in August 2009. In 2010 his collection of poetry This Is Not About What You Think appeared and this year his third novel, Milligan and Murphy, based on the writings of Samuel Beckett, will be published in paperback. This volume contains two novels, Living with the Truth and Stranger than Fiction, depicting the three days a world-weary old bookseller gets to spend in the company of Truth, an omniscient being with a wry sense of humour and an interesting agenda. Think Douglas Adams meets Alan Bennett with a touch of Charles Dickens, Franz Kafka, Neil Gaiman and Terry Pratchett thrown in for good measure. I am a Scottish writer living just outside Glasgow. I began my writing career as a poet. In the seventies and eighties my poems appeared regularly in the small press magazines that were legion at the time but by the nineties I had allowed myself to become disillusioned and stopped sending stuff out. I didn’t stop writing, however, but in my thirties I moved onto novels and in my forties jumped into short stories. Strange way to go about it, I know. No. Neither of my parents were readers. I don’t think my father ever bought a newspaper and my mother certainly never read any women’s magazines. So although I wasn’t actually discouraged from reading I was never actively encouraged. The books they did buy me when I was very young were mostly Hamlyn’s Enid Blyton books and I still have a special fondness for her retelling of the Brer Rabbit stories. Before I started secondary school (that would place me about twelve) I can only remember reading two proper novels, Kidnapped and Journey to the Centre of the Earth. I’m sure there were more but I could never call myself a voracious reader in fact I find reading hard work much of the time; I bore easily. I was determined my daughter would not be like me and so before she was born she already had a library of 100 books (including all four Brer Rabbit books) waiting for her and I’m pleased to say she hasn’t taken after her old dad. Like most people I like to see photos of the rooms writers work in and for years I was desperate to have my own office, so much so that when my wife and I started looking for the flat we’re in just now I placed two preconditions on her (she did most of the looking): firstly, no garden – I hate gardens, can’t stand them – and secondly, that we should each have our own office. I’m pleased to report both conditions were satisfied. The thing is, after a few years of working in my office, once I got a laptop I gravitated to the living room and I’ve worked there ever since. The bottom line is that I can work anywhere. I’ve written by hand, on a manual typewriter, an electric typewriter and on a computer; in trains, on buses, on my lap, standing in the middle of the street and when I should be working. I guess I’m lucky that way. I don’t need much to be able to write. I’ve gotten into the habit of playing music – classical mainly or soundtracks (I can’t write over vocals) – but I don’t need it. I got into the habit as a kid, to drown out my family next door. People. I’m not really interested in nature or politics or big issues like the environment or human rights. I like small, intimate chamber pieces. My novels always have a small set of characters and indeed are character driven; plot doesn’t really interest me. Basically I place a character in a situation, give him, her or them a problem to deal with and watch what follows naturally. The most extreme example of that is my first novel, Living with the Truth, where I literally have Truth in human form knock on some bloke’s door one Tuesday morning. I have gone through long periods of not writing (the longest was three years) but I’m not sure I believe in writer’s block per se because I’ve never lost the ability to write; I just found at times I had nothing I particularly wanted to write about. When you’ve only been writing for a few years you don’t really know what’s natural for you. When I hit that three year gap I thought that was me done with writing for good, but the first thing I did when it ended (or that caused it to end) was to sit down and write two novels back to back in the space of about three months, having written nothing bar poetry before then. Writers don’t have lives. They have ongoing research. Every day is a work in progress. Nothing’s sacrosanct. No one’s exempt. You can’t hand them a note from your mother to leave you alone. It doesn’t work like that. I believe that. That’s why after a three year gap I had enough material for two novels. I hadn’t frittered it away off a few dozen poems. I still write poetry – poetry has its place and is very important to me – but it also has its limitations. Jonathan Payne is a jaded bookseller at the end of a wasted life which has been spent in a drab north England seaside town. He could be an everyman, but seems to have missed the boat somewhere. He’s both distastefully pathetic and oddly sympathetic. A passive character, he has been happy to read about life without experiencing either great joy or great despair. If Death were to knock on his door it wouldn’t trouble him greatly. Truth proves to be a likeable, if infuriating, character with a novel mode of expression: “glib dipped in eloquence and then rolled in a coating of irony,” to quote one reviewer. He knows everything and has no qualms revealing intimate details of lives of the people who cross his path while he’s with Jonathan. He’s quite indiscriminate. The same reviewer described him as “one of the most endearing antagonists I have come across.” So comparisons with Peter Cook’s devil in Bedazzled are not unreasonable. Now had it been Death that had called that day it would have been all right. I had been trying to read a novella by Patrick Süskind called The Pigeon. I never got very far through it and the fact is that I only finished the book a couple of years ago. The central image stayed with me, though, a man who was terrified of leaving his apartment because there’s a pigeon blocking his way. Preposterous I know. I imagined my character looking out of his window one morning and seeing, although he doesn’t realise it at first, the personification of truth standing outside. Don’t ask me where that idea came from because I couldn’t tell you. I have never plotted. With that first book I simply placed my character in an awkward situation and let things develop naturally. It’s not stream-of-consciousness writing, though, not like Ulysses or Beckett’s trilogy, there is a story. I simply had no idea what that story was. Basically I write in chunks, a chapter at a time. I edit constantly. After I’ve finished a section I’ll go back to the beginning of the book and read right though to where I’ve stopped, tweaking as I go and then I do what feels natural at that point. No big things happen in any of my books (unless you count having Truth knock on your door) but after Truth makes his entrance what happens next? They go to work, have lunch, wander along the esplanade, go back to work, visit a carry-out, entertain Jonathan’s sister, watch an old Carry On film and go to bed; that’s the first half of the book. I just needed some stuff for them to do; it could’ve been anything. To be totally honest the whole book could have taken place in a single room. In Milligan and Murphy the main action consists of two blokes wandering down a road; in The More Things Change another bloke sits on a park bench for forty years; and in Left a woman wanders around her late father’s flat, watches the neighbours and chats on the Internet. Me. That’s not as facetious an answer as it sounds. Every book, every story, every poem I have ever written has been for me and me alone. That other people get something out of them is an added bonus. Essentially I write to – exorcise is probably too strong a word – to clear my head, to work things out. Once the words are on the paper I can stand apart from them and view them objectively. Writing is a process I have to go through. The end result is peace of mind. I’ve never belonged to one, not one where I had to put on my hat and coat and go out of an evening to attend one. I did hang around on Zoetrope’s workshop for a while which was an interesting experience. The rule there is that you have to review poems or stories by five other people to allow you to post one of your own. Some of the comments were interesting but I never changed a word of anything I posted afterwards. The moral of the fable? Please all and you’ll please none. And I’ve always said that I won’t carry a donkey for anyone. Everyone has an opinion which they’re entitled to but they can’t all be right. Listen to them all by all means but make your own mind up. In some respects I was lucky as a young writer. There was no Internet and where I lived there were no other writers. So I wrote alone and, although I’m glad the Internet exists now, in the midst of all the pluses for writers there are definitely a few negatives and one of those has to be access to immediate feedback – I’m not sure that’s necessarily such a good thing. No one, not even my wife, gets to read anything by me until it is finished. That doesn’t mean I won’t make a minor change or two after she’s read it but I am never in a rush to show anyone anything. I finished Left in January. My wife read it, told me it was good and I’ve not looked at it since. Eventually I’ll get back to it when enough time has passed; I’ll do a final edit once I can look at the book objectively and then it’ll be off to the beta readers.